452 sq. ft. interior dome, 740 sq. 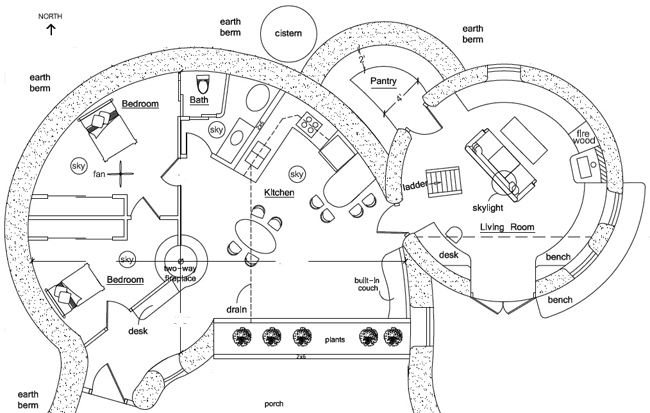 ft. interior spiral, plus pantry, 2 bedroom, 1 bath; footprint: 42′ x 57′ plus buttresses. Hi Owen, 1st sorry for the callout & 2nd thank you for the formula. Hi Owen, can you tell me how many sq ft of pumice or scoria it would take to build the spiral dome 2 house. This is dependent on whether or not this house can be build with this material that is. Sorry, I do do take-offs. This is something that readers can easily themselves. Estimate the lineal feet of wall length. Multiply that times the desired wall height. Decide on the depth of the walls. Then multiply everything to determine the cubic feet of material in the walls. Plug this number into an online converter to change the units to cubic yards so suppliers will know how much you need. They can give you a free quote. To find the online converter search for keywords ‘convert cubic feet to cubic yards’. Just curious about the exposed dome in Northern Ca wet winters….I have heard of doing stucco plaster, yet I don’t want to use cement. Would there be a natural way to weather proof the dome if we use earth/lime plaster? Don’t use earth/lime plaster on domes except in deserts. There are various ways to waterproof domes if you use cement plaster. We just had a story about repairing domes about 10 days ago that describes one method. 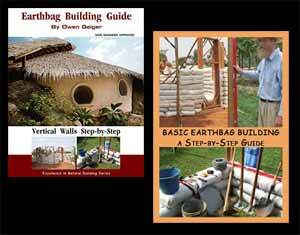 Hi Owen, could the Spiral Dome 2 be build out of straw bales instead of earthbags for better insulation purposes? This, I am thinking might eliminate the need for the earth berm on the north side. Also, could a rocket stove replace the 2 way fireplace in the spiral dome? Is there space in these plans for laundry facilities? Strawbale domes are too vulnerable to moisture damage. Don’t risk it. The earth berm is just a suggestion. It’s not essential. Can geopolymer be used in the bags and forms or even as a shell with a design like the Spiral Dome Magic 1 & 2? Yes. The challenge is finding an affordable source near you. My Geopolymer Blog lists about 8-12 companies. There may be more now. It’s easy to modify things such as the pantry. Make it whatever size you want. Cool pantries work great for most foods. Search this blog for full details on cool pantries. Kelly’s pantry is (or was before they moved) semi-circular and about 100 sq. ft. Their new one is underground with their cistern. Bags and tubes: See our FAQ page for calculating bags. Link at top of page. Is there an upstairs level in the dome? It says there are stairs, but to where? The stairs go to a loft. The pantry should be off the kitchen, not so far away that that one has to go through 2 rooms to get there. At least the floor plan #1 has the space to put in an adjourning door. Agreed, but sometimes things just don’t work out optimally. In this case it would work best as a closet, but could be used as a pantry if desired. Do you have any plans with 3 bedrooms? I love the spiral shapes and a structure that is hidden from view. Most of my plans are small and basic to keep costs as low as possible. It’s easy to add on extra rooms. Many people combine 2-3 structures and come up with something unique that meets their needs. 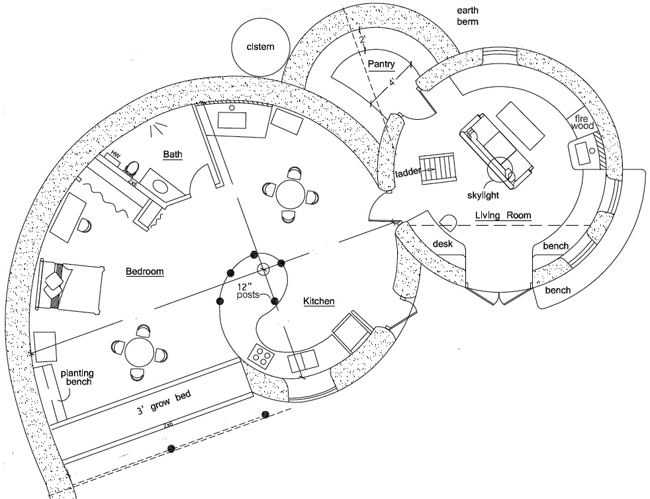 Print out 5 or so of your favorite floorplans — spiral, domes, roundhouses, etc. Cut off excess paper around the edges and then play around with the shapes. Keep in mind you can add doorways to join structures. You can also build free standing structures one at a time and join them with covered walkways (which can be enclosed if you want). You can also add on greenhouses, laundry rooms, pantries, rootcellars and other rooms. The possibilities are endless.